Fig. 11. Highlander serpentine, coil (right - bottom part of the plant with rhizome). 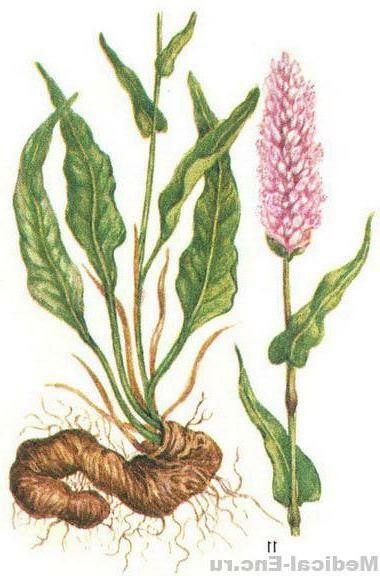 Highlander serpentine, coil (Polygonum bistorta L.) is a wild plant. Contains tanning substances. Tincture (15-20 drops on 1 glass of water) is used as an astringent for rinsing, and extract liquid - for lubricating gums. Broth (20 : 300) designate for rinsing with stomatitis and gingivitis; 1 tablespoon every hour with dysentery and other acute inflammatory processes in the gut. Highlander serpentine, coil, or cancer of the cervix. It is a perennial herbaceous plant with a large oblong leaves and blunt tip, disbecause in long winged petioles. Dense inflorescence of small pink flowers adorns the top of the stem. Swampy shores of lakes, raw Bush meadows, grassy bogs are favourite places for Highlander serpentine. Growing thickets. Rhizome his shaped like a snake curled under. And cancer of the cervix, it seems: they are pressed slightly and surface folds. In the second half of the summer after his fading or spring, before he discard the stems, dig medicinal roots serpentine. Thoroughly shake off, washed, cleaned the knife from the stems, roots and leaves, cut into pieces by 10 cm and dried. First, in the air or dryers, if the weather is bad. It is necessary to dry quickly, otherwise rhizomes inside will poborot or mouldy. Will break open the dried rhizome, if it is brownish-pink, so all you have done is right, good raw materials prepared. Roots contain tanning substances, their use as an astringent for rinsing of the mouth, inflammation and upset stomach. Part of gastric fees. Close view of the coil - Highlander maskrey grows in the Alpine meadows of the Caucasus. Its roots can also be collected.